With the most iconic beauty brands available via online shopping, exclusive Avon products delivered to your home by a woman who also lives in your neighbourhood are now a quaint relic. Coupled with the embrace of cosmetic emporiums like Sephora, the doorknock and friendly cry of “Avon calling” will come to an end in Australia and New Zealand later this year. I haven’t used an Avon product since being hooked on the girls’ “Little Blossom” range of demurely “tinted” pink nail varnish and lip gloss in the 1980s. 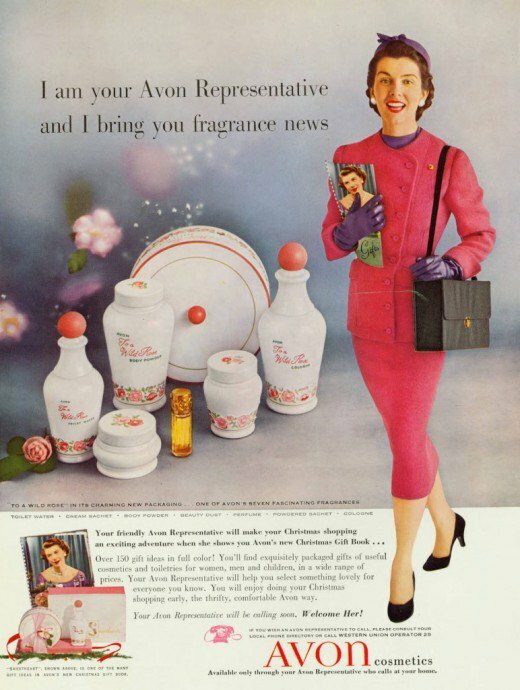 While younger women may not have continued to use their products in the Instagram era, the Avon lady was once a radical figure who played a pioneering part in women earning their own incomes. Avon began with a man, David H. McConnell, selling books door-to-door to a captive market of housewives in the 1880s. When he began to offer women a free sample of a custom-made perfume in return for listening to his book spiel, they were more interested in the scent than the books. It was not as simple as ducking down to the shops for cosmetics for many women with no mode of transportation, particularly in small towns. Persis Foster Eames Albee, the first "Avon lady"
Persis Foster Eames Albee from Westchester, New York joined his California Perfume Company and initiated the famous method of women selling directly to other women door-to-door. While travelling salesmen were common, Albee pioneered the model of a low-pressure “house call” that was as much a socialising opportunity as a sales pitch and opportunity to demonstrate products. With very few opportunities for most women to work or access welfare, they were largely financially dependent on their husbands. 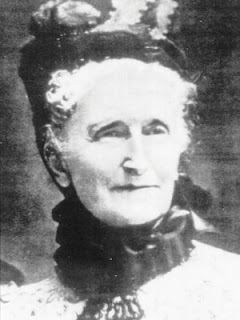 In her twelve-year career, travelling by horse and buggy and train, Albee trained up 5,000 American women to sell cosmetics through the California Perfume Company. She granted them the rare opportunity to generate their own income without neglecting their family responsibilities or breaking expectations of how women should behave. Inspired by Shakespeare, McConnell renamed his company Avon in 1928, as it expanded well beyond its original “Little Dot Perfume Set”. 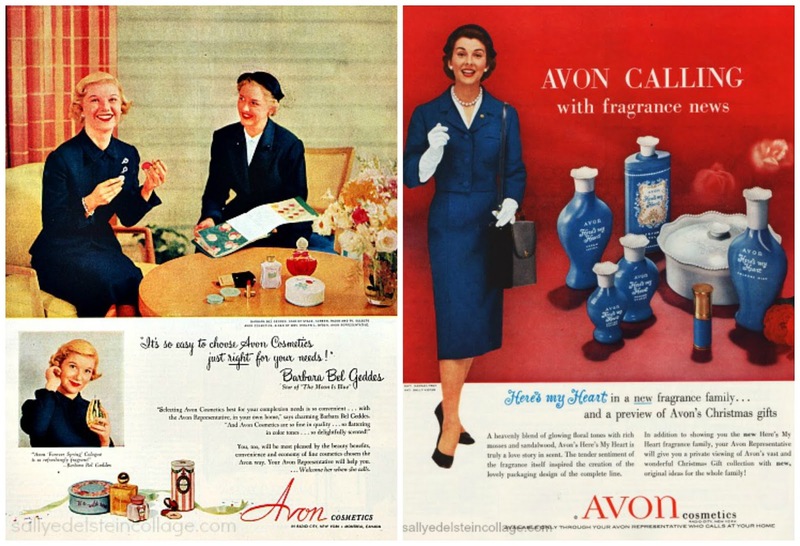 While the post-war emphasis on family life in suburbia stultified enough mothers to drive them to self-medicate with alcohol and prescription drugs, Avon provided an outlet for women to nurture or regain a professional identity. The pastel-wearing Peg Boggs in the film Edward Scissorhands neatly embodies the void that Avon sales filled for housewives in suburbs where the men emptied out in sync every morning only to return in the evening. While most married women were locked out of the world of work that was a car-ride away, through Avon many turned the homes around them into places of business and joined a network of industrious women. Like Tupperware parties, which were popularised in the 1950s, selling Avon did comply with a culture that wanted to keep women in the home, devoting their attentions to housework and maintaining their looks for their husband. However, the discriminatory workplace practices of the past meant many married or pregnant women could not continue to work outside the home. Regardless of whether women were selling food storage containers or lipsticks, they were still mobilising their business skills and earning money that might not be controlled by a man. Today, as department stores lose their cultural cachet, more cosmetics are bought through browsing products on websites, in much the same way as women would browse the printed Avon catalogue. What is lost, however, in these transactions is the thousands of women who found a degree of financial independence and personal satisfaction through their own local sales business. The women of 2017 have more employment opportunities and work rights than those of the 1880s or even the 1950s, many of whom had few options beyond toting cosmetic samples around their suburb on foot. Nevertheless, the perennial problems of household and child-rearing responsibilities continue to plague women and hamper their abilities to build careers and earn their own incomes. Now some women are establishing their own businesses online that allow them to tread the same fine line between independence and maternal responsibility as Avon ladies of generations past. 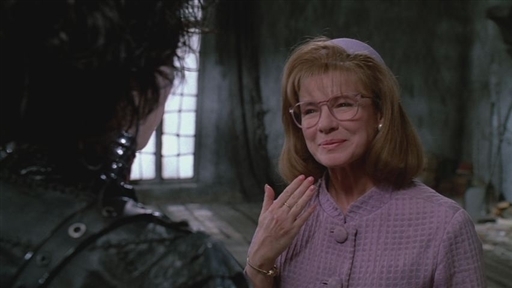 While the need for Avon’s kitsch ornaments and scented talc may have declined to the point where Australian operations are no longer viable, the need for flexible working options for women has not.